Denon's new AVR-S720W and AVR-S920W receivers to deliver nearly every major audio and video feature you could ask for. 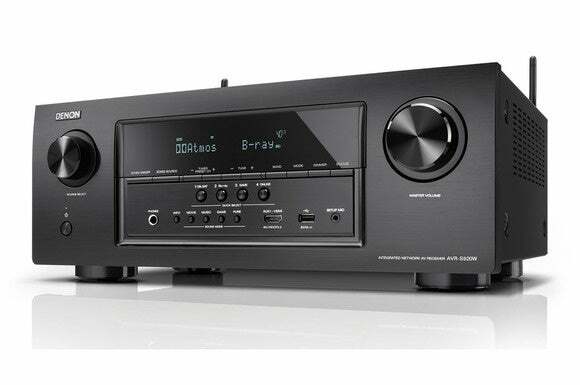 Audio and home-theater enthusiasts in the market for a high-performance A/V receiver with all the latest features at a reasonable price will want to look into Denon’s latest S-series models, the AVR-S720W and AVR-S920W. 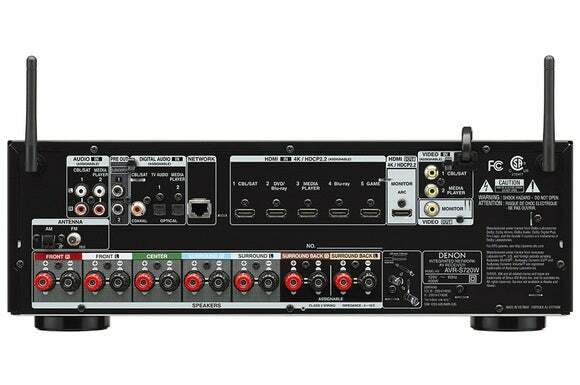 These 7.2-channel receivers are built for 4K Ultra HD, with every HDMI input supporting HDMI 2.0a and HDCP 2.2. That means every input supports 4K Ultra HD 60Hz video, 4:4:4 Pure Color sub-sampling, High Dynamic Range (HDR), 21:9 video, 3D, and BT.2020 pass-through, so that you’re getting all the benefits of 4K UltraHD resolution. Many receivers competing in this price range shortchange you by delivering HDMI 2.0a and HDCP 2.2 on only one or a few inputs, with the rest limited to the older standard. 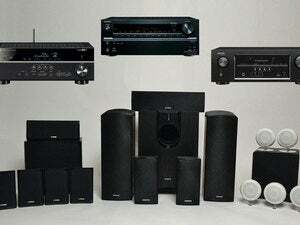 You might also want to read The next big things in home-theater: Dolby Atmos and DTS:X explained. Both receivers support Dolby Atmos and DST:X immersive audio, although the latter standard won’t be supported until August (by way of a free firmware update). The on-board seven-channel discrete amplifier allows you to power up to a 5.1.2-channel immersive audio setup. While there are no preamp outputs for a full 5.1.4-channel setup, dual subwoofer outputs give you the option of running two subs, or you can shake the neighborhood with up to four subs using an RCA “Y” adapter. Thanks to research by Todd Weilti of Harman International, we know that four subs are the ideal configuration to address room modes in a typical rectangular room. Rear view of the Denon’s new AVR-S920W AV Receiver. The AVR-S920W sports an additional HDMI output and a more powerful amplifier. For those who love to kick back to traditional two-channel or multi-channel music, you’ll be happy to know that high-resolution playback and high-resolution audio streaming of DSD (2.8/5.6MHz), FLAC, ALAC, AIFF, and WAV are all supported. Both models have dual band Wi-Fi and Bluetooth plus extensive home-networking capabilities, too. 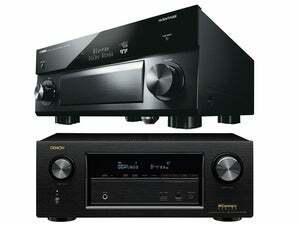 The AVR-S702W and AVR-S920W also link up to Denon’s HEOS whole-home audio system. These units feature IP control capability, and when paired with the HEOS Link, you can control the receiver with the Denon HEOS app. You can also take advantage of the traditional streaming protocols such as AirPlay and DLNA 1.5 or services such as Internet Radio, Pandora, Spotify Connect, SiriusXM. The receivers support audio in a second zone, but because there are no pre-amp outs, you’ll need to assign the sixth and seventh amplification channels to Zone 2. Rear view of the AVR-S720W. 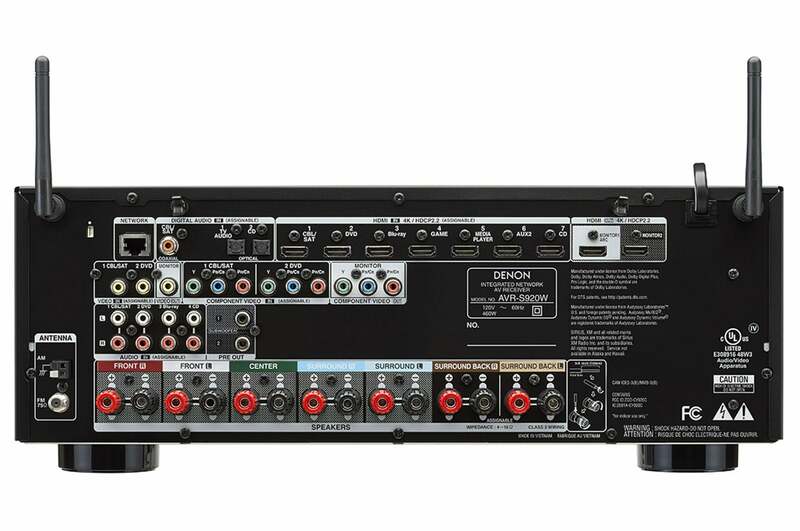 Though there are only six HDMI inputs and a single HDMI output, the S720W has seven built-in channels of amplification for a traditional 7.1 setup or a Dolby Atmos and DTS:X 5.1.2 setup. To help tame audio problems in your room, the new receivers sport Audyssey’s Bronze suite, which includes MultEQ room acoustic measurement and DSP correction. Denon says that the $479 AVR-S720W delivers 165 watts maximum power output per channel (6 ohm, 1kHz, with one channel driven), or 75W (8 ohm, 20Hz-20kHz,with THD of 0.08%). Note: Always take a manufacturer’s amplification specs with a grain of salt unless the power rating listed is with all channels driven. For an additional $100, the $579 AVR-S920W adds 185W maximum power output per channel (6 ohm, 1kHz, with one channel driven). You also get two additional HDMI 2.0a inputs for a total of eight (including one in front) and dual HDMI outputs with full HDCP 2.2 support—just the ticket for supporting a video projector in addition to a TV in your home theater. Denon did not specify if the dual HDMI outputs are parallel or independently switched; however, at this price point and without an explicit mention of a second zone, its a safe bet that this is a parallel HDMI output. The S920W also features advanced video processing, with 4K upscaling. You can’t jump over to Amazon to buy them just yet. 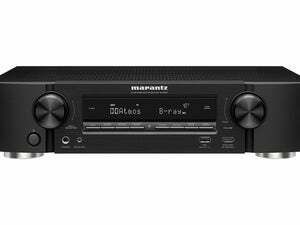 The new receivers will be available later this month.